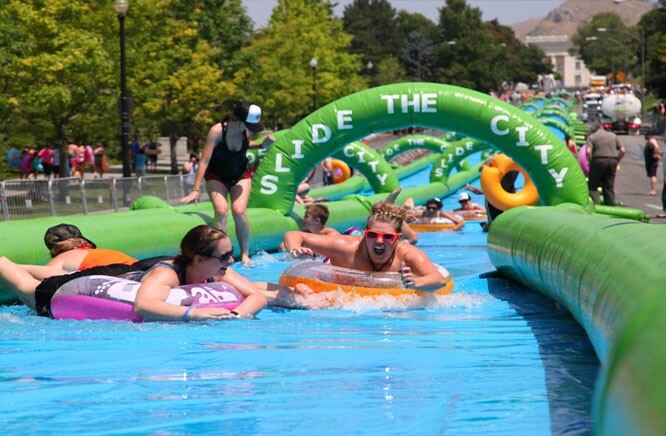 Slide the City events across Washington state – like one scheduled for August 8 in Spokane – have officially been canceled due to permit issues with the Washington Department of Health. In a press release, Slide the City announced the cancellations of Seattle, Richland and Spokane events and blamed “delays in health department permitting” from Washington state while praising the “months of hard work and coordination” from city officials. My Spokane Customer Service Director Carly Cortright says the city looks forward to having the event next summer. “The City of Spokane will definitely work with the event and DOH to host them in Spokane in 2016, and are disappointed for our residents it didn’t work out this year,” Cortright said via email. While organizers seem to blame the postponed sliding on bureaucratic delays on behalf of the state, blame might be more appropriately assigned to an alleged lack of promptness on behalf of the organizers. The Tri-City Herald reported that, according to health department spokesman Marqise Allen, organizers were asked to submit information to the health department in February but did not turn it in until July. Once it had been reviewed, the state had questions for the organizers regarding water treatment and sanitization as well as safety of sliders. This was detailed in a letter sent July 9 by a representative of the health department’s water recreation program. In the July 14 article, the Richland Slide the City event coordinator said the organization “absolutely” planned to address the questions and put on the event in August. More than 12,000 people joined the "Slip n Slide Spokane" Facebook event. Would-be attendees have been waiting since at least January for tickets to go on sale and more information to come. Slide the City brings a 1,000 ft long slip and slide to cities across the United States. It became famous through viral videos like this one. It is pitched as fun for the whole family, and videos make it seem like it is a seamless, fun community activity. However, some have complained about prices – which, if purchased in advance, is $16 for one ride and $51 for five – and others have reported wait times of up to three hours for one ride. Why is heroin so addictive, and how should we treat it? A first look at Macklemore & Ryan Lewis' new Spokane-shot video "Downtown"